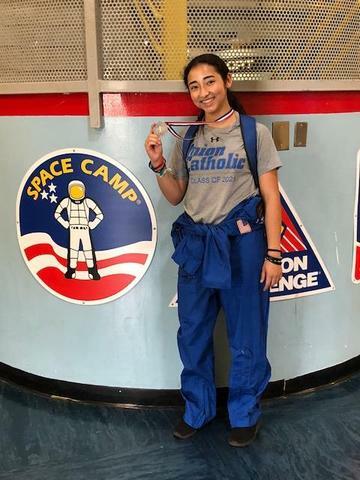 After completing Space Academy last year, Almeida, a rising sophomore at Union Catholic, returned to complete the Advanced Space Academy and Mach III programs this summer in Huntsville, Alabama. During the graduation ceremony, Almeida received great news when it was announced that she was the recipient of the Advanced Space Academy’s Right Stuff Award for her age group, one of the highest honors at Space Camp. The Right Stuff Award, named in the spirit of the Tom Wolfe novel of the same name, is given to an outstanding trainee each week in both the Space Camp and Aviation Challenge programs, and is given in honor of the early space explorers and test pilots who were pioneers in the fields of rocketry and jet propulsion. Almeida has always been fascinated with space. Almeida said Space Camp is an incredible experience. What was an average day like at Space Camp? Almeida said the experience at Space Camp was unforgettable. Almeida said her experience has changed her outlook for the future.